← A Mortgage in the State of Nature? Underwater and the Strategic Default PR Campaign, 4: The odd definition of the Experian study. From the Wall Street Journal, Study: Nearly One in Five Mortgage Defaults Are ‘Strategic.’ That’s a fairly high number! What do they mean by a strategic defaulter? 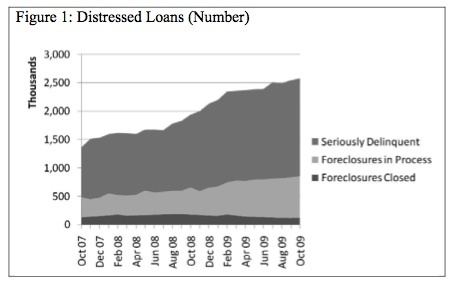 The research follows on an earlier report by Experian and Oliver Wyman that first aimed to quantify the share of mortgage defaults that are “strategic.” Strategic defaulters are defined as those who miss six straight mortgage payments without missing multiple payments on auto loans and other consumer debts for the six months after they first fell behind on mortgage payments…. Researchers suggest that the share of strategic defaults may have hit a plateau as total mortgage delinquencies and may have also peaked in the fourth quarter of 2008. “We’re seeing this encouraging break in the quarterly data,” said Charles Chung, general manager of decision sciences at Experian. I don’t see that as a good working definition of strategic default. From their model a strategic defaulter is someone who misses six straight months of mortgage payments without missing multiple payments on auto loans and other consumer debts. Now it can be fairly easy to keep consumer debt “current” by negatively amortizing it, or making the bare minimum payments, so the definition isn’t about those not paying the rent to go to Disneyland. All this definition means is that someone has enough money to pay their car payment and the minimum on their credit card but not enough money to pay their mortgage payment. The mortgage payment is going to be bigger than each of the other two, and there is no benefit to paying part of the mortgage payment, as it doesn’t keep it current. The definition you want is whether or not someone has income to make all their payments, not how they allocate payments. This is a definition for a bankruptcy judge, not a statistician. This other working definition is a huge, expansive and doesn’t get at what people are worried about. In fact, to really illustrate it, think about what it means for someone to have a legitimate default here: they can’t make any payment on any of their bills. Only when your car is repossessed, only when your credit has been cut, only when the gas is shut off, only then can you excused for not making a payment on your second lien. That’s simply not how people act. (Source for graph.) In fact, look at the perverse notion that of what constitutes a “lessening” of strategic defaults here – people can’t make their mortgage but also can’t pay their car bill either. They want to color that as progress, but it’s the exact opposite of progress! Delinquencies are skyrocketing, but even with this overbroad definition of what constitutes a strategic default it’s already over. Now this theory and data is consistent with people optimistic that they’ll be able to find work sooner than later after being laid off, juggling some mortgage payments but keeping most everything current, and then slowly realizing that 9.6% U3 unemployment (and near 17% U6) is the new normal. The narrative here is to function as a meta-call to clamp down on homeowners, when anyone actually looking at the data would conclude, in the words of the Federal Reserve Board: “The fact that many borrowers continue paying a substantial premium over market rents to keep their homes challenges traditional models of hyper-informed borrowers.” Challenging hyper-informed borrower models is a nice way of saying that most people aren’t the throat-cutting sociopaths that game theorists and economic modelers think they are. They take their obligations seriously, they value their communities, neighbors and lives and won’t rip their faces off simply to save 10% on a rent calculation. It would be nice if banks stopped taking advantage of that in a crisis, and that the government cleared the field of problems in letting real modifications go through. Because this is the model where the ethical thing to do involves having people eat cat food rather than having a bank meet someone perfectly halfway with a small principal reduction, which they are refusing to do. They are encouraging people to go through loan modifications, a process that has has a high failure rate and that serves to simply recapitalize fees into balance, that often leads to higher payments, a process that works as an information filter on who is willing to pay whatever it takes to stay in their homes. I don’t think we’ll ever have a good statistical definition of this: the best way to judge this is to let an actual bankruptcy judge handle it. For further general reading, Henry Sommer has a post at creditslips about trying to get voluntary mortgage modifications within a chapter 13 context. And Yves Smith talks with a real estate expert off the record who is saying what I hear more and more these days – that the second liens are the real serious obstacle to mortgage modification. And in what I worry is a silent austerity measure that is already ongoing, people are going to eat cat food to stay in their communities because the stress tests measured the second liens at 86 cents on the dollars, and we need to make sure people will pay into four of our most powerful banks to that point. But watch the media scare you with stories about mean people skipping their bills to go to Disneyland. 3 Responses to Underwater and the Strategic Default PR Campaign, 4: The odd definition of the Experian study.